Simple, Easy, Effective Task Management. 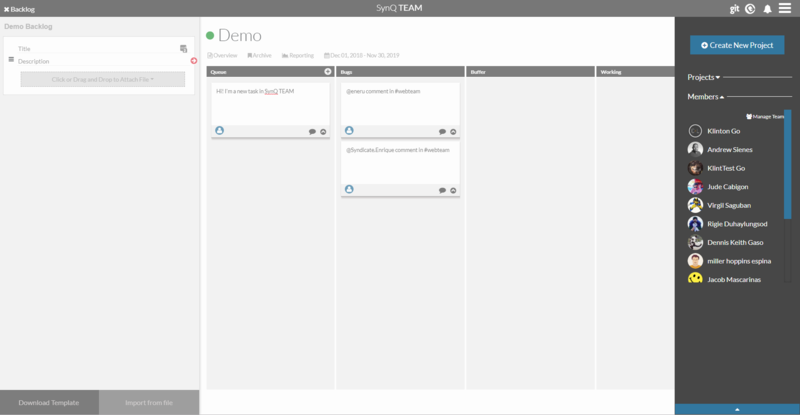 SynQ TEAM is a flexible task management application built with “getting it done” in mind, regardless of how small or large the project. Whether you’re at your desk or on the road, SynQ TEAM is at your service. With our purpose-built application design for both web and mobile applications, you hold the reins to your projects anywhere, anytime. Try SynQ TEAM for free for seven (7) days with absolutely no obligation to continue if TEAM doesn’t work for you. Kanban is a project management methodology used in product and software creation all over the world. SynQ TEAM was created by the developers of SynQ to fill a void in their own project management requirements to keep projects moving, and moving fast. Building a wallet? Developing a Platform? Making CryptoHamsters? SynQ TEAM is a low overhead application keeping you and your team focused on organizing tasks effectively and allowing you to get to work and get results. Unlike other task management applications, SynQ TEAM is designed from the ground up with the bottom-line in mind, knowing that our platform isn’t meant to prove it’s worth with overbearing and useless features; just the stuff you need to get it organized, managed, and done. Sign up for our 7-day, No Obligation, Free Trial. There’s no better way to put it; SynQ TEAM is a clean, fast, fluid interface built to keep you focused on the tasks at hand. Create new tasks, use keyboard shortcuts, assign them to accountable team mates, provide due dates, embellish them with advanced descriptions, supply notes, attach assets, and update their status as they progress through the project stages. SynQ TEAM includes role-based features, keeping team members focused on their work while allowing managers the ability to take command of projects, plan ahead, and keep an eye on everything as tasks progress over time. Bulk import tasks, creates custom Lane-templates, build out new projects in a few short keystrokes, and more! As a Project Manager in SynQ TEAM you’ll enjoy key features that enable you to coordinate tasks across multiple projects with ease. Customize SynQ TEAM’s columns to match your exact project flow needs; create, edit, and save as many column templates you require or simply use one of the many system generated, pre-built column templates to get going right away. Manage any type of project, the possibilities are endless. Laser-focused feature set designed to keep you on task. With your SynQ community and SynQ TEAM, you can create tasks on the fly, select the project, and the lane, include a comment, and keep things moving for your users! Pick a Project. Pick a Lane. Done! Unlike the other guys, SynQ and SynQ TEAM were built from the beginning to work with each other, quickly, effectively, and seamlessly. 7-day, no obligation, full-featured, completely free trial.